Global Energy Metals CEO Mitchell Smith discusses the state of the cobalt market and what his company has done to stand out among its peers. Global Energy Metals CEO Mitchell Smith (TSXV:GEMC) is optimistic about the state of the cobalt market. He believes that the increased demand associated with electric vehicles and their batteries will keep the market stable as copper prices begin to bounce back. In the interview below, Smith discusses the company’s cobalt projects in Canada and Australia and how Global Energy Metals fits into a market where it is important to have diversified sources of cobalt supply. 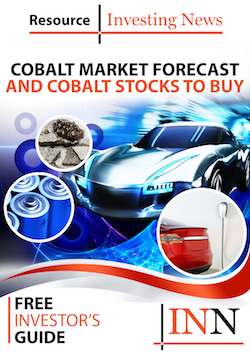 He also provides an overview of the cobalt market, suggesting that it will remain strong in the upcoming year. Below is a transcript of our interview with Global Energy Metals CEO Mitchell Smith. It has been edited for clarity and brevity. Investing News Network: Please tell our investor audience about your flagship projects and the progress you have made in the last year. Global Energy Metals CEO Mitchell Smith: Global Energy holds two projects. The first is our Canadian asset, the Werner Lake cobalt project, for which we recently completed a NI 43-101 resource. I am very pleased to have just announced that we have an option on this very important Canadian primary cobalt project with Marquee Resources (ASX:MQR), who have expressed an interest to move quickly to activate the development of the project. Our focus is currently on the Millennium cobalt property in Mt. Isa, Queensland, Australia. We recently entered into an option to acquire up to a 75-percent interest [in the project]. We just announced a work program as part of our earn in for the asset, and we feel there is a real upside to prove up the existing resource and further develop the project. INN: What is the level of insider share ownership at Global Energy? MS: As a management team, we have been long-term supporters of the company and of the cobalt market as a whole. Global Energy’s management and board collectively own 30 percent of the company’s issued and outstanding shares, acquired well above today’s trading share price. INN: As more and more companies enter the cobalt market, how does Global Energy stand out from this group of newcomers? MS: There has been a lot of recent interest in the cobalt space. What differentiates us from the other groups in the space is that we have 10 years of experience in the cobalt market. We have also established relationships in the downstream market, having partnered with Beijing Easpring Material Technology (SZSE:300073), Easpring for short, which supplies battery producers like Panasonic (TSE:6752) and BYD (SZSE:002594). There is a real opportunity in furthering other relationships in the downstream market. Additionally to that, we have two very good assets. We have an excellent operating team, Hammer Metals (ASX:HMX), advancing the Millennium project in Australia and we are looking to further develop our portfolio of cobalt assets. INN: What are the upcoming catalysts for Global Energy that investors should be aware of? MS: To begin with, the upcoming work program at the Millennium project should spur some very real catalyst movement in the company. In addition, we see that there is significant opportunity within our Werner Lake project, and through Marquee’s strong funding and operating team we will advance the project and build value for shareholders under very robust cobalt market conditions. We are also moving forward with listing the company in the US. We have noticed significant interest from US investors, so we are opening this up as a mechanism for them to be able to to participate in the stock. In the future, there will also be further acquisition and partnership opportunities, along with additions to the team that will strengthen an already competent and sophisticated leadership group. INN: What do you think is next for the cobalt market? MS: The cobalt space is really heating up, and people are much more educated on it than they used to be. Investors are noticing that the assets held by cobalt companies need to be part of the supply chain to downstream users. Global Energy is fitting into this quite nicely and there is plenty of opportunity for shareholders. INN: Is the source of the cobalt something that customers consider when choosing a cobalt supplier? MS: There has been lots of discussion about incorporating a tiered system with regards to where material is sourced from. This comes as a result of the malpractice associated with artisanal mining, particularly in the DRC. As such, there are companies looking for diversified supplies of the material. We have seen this exemplified in our partnerships in China. The Chinese government has mandated that companies diversify their supply beyond the DRC. This doesn’t mean that supply from the DRC will halt entirely, but there is significant speculation on how supply channels might change in the future. INN: There seems to be a negative correlation in the prices of copper and cobalt. Are you concerned as copper prices start to bounce back? MS: Ninety-eight percent of the world’s cobalt comes as a by-product from either copper or nickel production, and the majority of that comes from copper mined in the DRC. With copper prices back on the rise, there will be more production of the material. However, there is a high cobalt demand now for electric vehicles and their batteries, and even an increase in supply might not be able to match it. The interview below was originally posted in May 2017. Please scroll up for the latest Global Energy Metals interview. Global Energy Metals (TSXV:GEMC) is building the world’s first “Battery Minerals Project Bank” of advanced-stage, near-production and producing mining projects to supply cobalt and other battery materials to the growing rechargeable battery market. The Investing News Network (INN) asked Global Energy Metals CEO Mitchell Smith about the upside to the cobalt market as well as the company’s strategic partnership with Beijing Easpring Material Technology (SZSE:300073). Global Energy Metals is managed by a team of industry professionals who are well versed in the battery metals supply chain and markets. The company has developed a strong network of partnerships and relationships with leading battery component manufacturers and other downstream users of battery-related metals. In March 2017, Global Energy Metals signed a long-term strategic cooperation agreement with Beijing Easpring Material Technology, a leading battery manufacturing company, to jointly invest in and develop cobalt projects. Global Energy Metals’ flagship property is its wholly owned Werner Lake cobalt project in Ontario, Canada. A past producer with significant potential for resource upgrading and expansion, Werner Lake is one of the only primary cobalt projects in North America. Global Energy Metals is actively evaluating high-quality assets to further build shareholder value. In May 2017, the company announced an agreement with Hammer Metals (ASX:HMX) to earn an interest in the Millennium copper-cobalt-gold project in Northwest Queensland. Below is the video and transcript of our conversation with Global Energy Metals CEO Mitchell Smith. Global Energy Metals CEO Mitchell Smith: It is a question we have been asking ourselves for nearly a decade. Senior management of Global Energy Metals has focused on the cobalt space for over 10 years, and we are early adopters to understanding the importance of cobalt to the battery minerals space. We feel there is a very interesting time ahead of us in the cobalt arena and look forward to being part of it. INN: What differentiates Global Energy Metals from the other cobalt companies entering the space? MS: A number of factors differentiate us. Global Energy has assembled a very unique team that has a deep sector knowledge on cobalt, and battery minerals in particular, and also on the supply and offtake relationships that go along with that. In addition to that, we have also secured a partnership with a leading battery manufacturer. Beijing Easpring Material Technology is one of the world’s leading battery cathode manufacturers. They are located in China and they supply five of the world’s six largest battery producers, including LG Chem (KRX:051910), Panasonic (TSE:6752) and Samsung (KRX:005930). Easpring has a mandate in place to secure upstream raw material, so they have partnered with Global Energy Metals because they recognize our role in the space. Together we will co-invest, co-develop and fund future project acquisitions in the cobalt space. INN: How does your recently announced acquisition of the Millennium cobalt project fit into Global Energy Metals’ strategy? MS: Millennium is a significant cobalt project based in the Mount Isa region of Australia. The project has excellent potential to grow in terms of size and scale. It is also an advanced project with historic metallurgical work done and a JORC-compliant resource in place. The project can be fast tracked into a production decision with exploratory and development work over the course of the next several months, with the potential to become a future supplier to our downstream partners. INN: What is your outlook on cobalt? MS: We believe that there are strong short-term fundamentals for the cobalt price to remain relatively the same; demand will continue to increase, keeping that price buoyant. Supply will come back onstream in the future with groups like Glencore (LSE:GLEN) and CMOC in the Democratic Republic of Congo bringing back production from their copper and nickel projects. That being said, we believe that there is strong opportunity for Global Energy Metals to become a niche supplier into that market.